Scholastic Inc. really does remain one of my favorite companies for educational material. I have to stand up and applaud them, because not only do they produce excellent materials in English, but they also strongly support bilingual education. One of my favorite sites is their Hispanic Heritage section, which includes a description of Hispanic history in the Americas, and biographical information on famous and historical Latinos. It also features a teacher's guide and activities, such as this Toma Todo game from Mexico. Most recently they have created a bilingual newsletter with links to resources and activities for bilingual families and teachers. 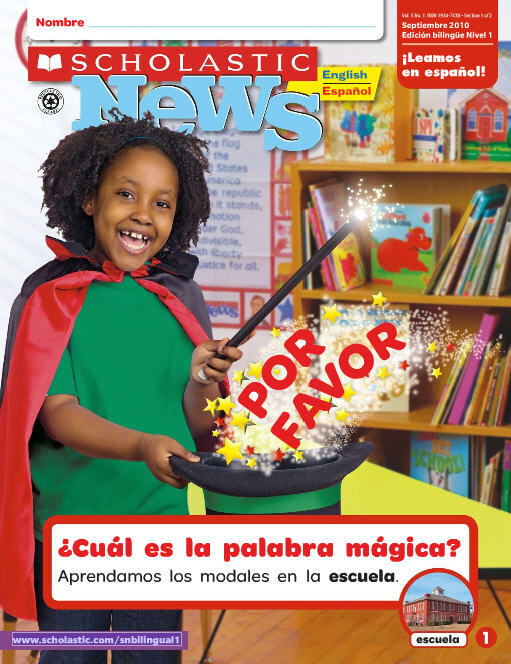 Teachers can also subscribe to any of their classroom magazines, some of which are also available in Spanish. My name is Isabel Santos and I am editor of Scholastic News English/Español. It's been a surprise to see my magazine in your blog and I want to thank you for your support. I was trying to contact you by email, but I don't know how. Please contact me at isantos@scholastic.com. Do you mind if we post your blog in our Scholastic facebook profile? You can order the Scholastic classroom magazines through Amazon, and you are able to receive a single copy of the kids' edition PLUS all the teacher materials--posters, copiable pages, lesson plans, etc. as well, for a pretty cheap rate (around $10, depending on the grade level). My understanding is that through Scholastic directly it costs significantly more if you want to get the teacher's materials without ordering multiple copies of the children's edition. You can also order great books from Scholastic's Club Leo. The minimum order is $20, and you slowly build up points to get free books, as well. Thank you so much for including Mommy Maestra in Scholastic's FB page. I have enjoyed many of the products you offer and look forward to learning about more. Thanks for the great tips! I am going to check out Amazon for their teacher materials. And I love Club Leo! Will have to talk more about that soon. Tricia, will you contact me via email when you have a chance? admin at latinbabyusa com. Thanks! Los pollitos dicen…pío, pío, pío, pío!!! !